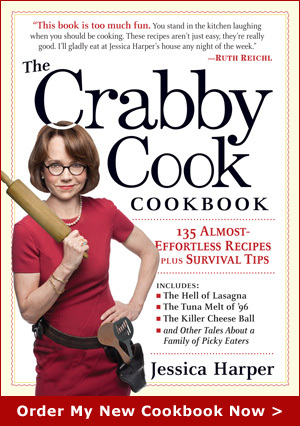 Revisited this recipe in The Crabby Cook Cookbook and like it even better now. For my non-dairy daughter I omitted the cheese. She loved ’em. It’s football season. You’re gonna be glad you have this recipe, trust me. With a little guacamole on the side, even better. Preheat the oven to 200º F.
Heat one tablespoon of the oil in a 10-inch, non-stick skillet over medium-low heat. Add the onion and the jalapeno pepper and cook until they are soft, about five minutes. Add the garlic, chili powder and ¼ teaspoon each of salt and pepper and cook for one more minute. Add the beans to the onion mixture and stir, crushing some of the beans lightly with the back of your spoon. Place the onion/bean mixture in a bowl and set aside. Assemble your quesadillas: lay a tortilla on a flat surface and spread about 1/3 cup of the onion/bean filling on half of the tortilla. Add one or two tablespoonfuls of chopped tomato and a sprig of cilantro, top that ¼ cup of cheese and fold the tortilla over. Repeat this with the other tortillas, forming four quesadillas. 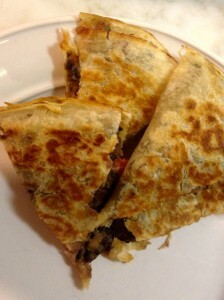 Brush the tops of two quesadillas lightly with oil and place them in the skillet, oiled side down. While they cook, brush the other side with oil. Cook the quesadillas until the cheese starts to melt, about 3-4 minutes. Flip them over and continute cooking until the other side is crisp and golden. Place the quesadillas on a baking sheet and place them in the oven while you make two more. Serve the quesadillas hot. You can serve them with salsa and/guacamole on the side, if you like. This entry was posted on Friday, September 20th, 2013 at 7:25 pm	and is filed under Let Me (Not) Entertain You, Soup 'n Sandwich. You can follow any responses to this entry through the RSS 2.0 feed. You can leave a response, or trackback from your own site.